I've come a long way over the past several years in my eating habits, including trying new things. But, the one thing I tried that I refused to try again was kale. I had bought some kale for my salad couple years ago and it tasted like freaking dirt! After that I had the attitude that I've tried it, I didn't like it, and I'm not eating it. 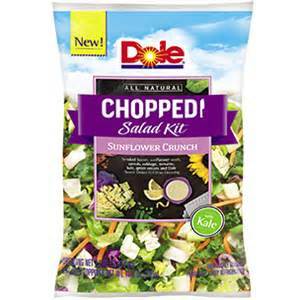 So, when a co-worker mentioned a salad mix that included chopped up kale I kind of turned up my nose. She was explaining it was chopped up really well, mixed with some other greens, and it tasted really good. Today we had our monthly birthday luncheon for our team, and she mentioned bringing this salad mix. I thought, okay, I'll try it and I said I would bring grilled chicken because this isn't a reward day and it's not a high carb day, so this is something I could eat. After my yoga session, I put a pile of this salad mix on my plate, topped it off with some grilled chicken, and instead of using the dressing it came with I used my light dressing I keep in my office fridge. I had already told myself that I probably wouldn't like it and that I could just pick out the kale or just eat the chicken. But, when I took a bite, I was like this is so delicious! Not only had I gotten inside my own head about this salad mix before I even tried it, but I had allowed my one time experience with kale to get in my head and assumed it would be gross just because it had kale in it. So, the lesson here is try new things! Even if you've tried them before, keep trying them in various ways. You never know when you might actually like something if it's prepared right!